I came late to the feeling that the purity of mathematical ideas had any need for story or for the temporal intrusion of personal accounts. But, I’ve changed, quite a bit. In fact, Apostolos Doxiadis and I have just published Circles Disturbed, a book of essays written by over a dozen scholars in different fields, regarding the complex interplay of story and mathematics. said Archimedes to the Roman soldier, who in response, slew him. Stories like that can color, but can they illuminate? When I was younger I felt that mathematical ideas should shine out, and that’s that. No need to spread any frosting (i.e., narrative, as I would have called it), on the cake of logic. But mathematics is, at heart, about understanding, and it will greedily use to the max absolutely any tool required for, or even helpful to, real understanding. Now, precise definitions, accurate labeling and rigorous logical argument, of course, are what people naturally associate with mathematics. But that is hardly sufficient; for much comprehension depends on knowing things that are behind the logical scene, i.e. the “noises off” of intentions, frustrations, surprises…and all this inevitably weaves an intricate fabric of story into the rational. No wonder life (the thing that my once 10-year old niece referred to as “the thing that isn’t fair”) comes to us as a filigree of flash stories. Walking down the street past a couple in conversation, an overheard morpheme, a mere glance at a wrongly buttoned raincoat, sparks a narrative in our imagination. Ask any question beginning with “why?” and the answer will surely be a story, or it will be embedded in a story. Or, at the very least, it will offer a tempting thread for some story that you yourself will hold onto, embellish even, as you try to absorb the answer. We interpolate between such fragments. This is, for many of us, simply the way we think. What about the “why questions” in science, in logic, in mathematics? We should acknowledge how they are often “what questions” or “how questions” in disguise. Or how they slide down into such questions, as the ever-elusive, ever-illusory quest for an X that actually causes a Y dissolves. Some of the more satisfying answers to scientific “why” questions involves deft rephrasing. “Why is the sky blue?” is replaced by the question “what is the function that describes scattering amplitude as dependent on wave-length”? Why is it important that that proportion is so difficult to understand, or even express? there is no satisfactory response to it, other than some narrative. To explain almost anything (mathematical concepts not excluded) you must launch into a story. And, much of the time people, and not disembodied ideas, are the main characters. Who they are, how they are, their tribulations and successes. This is the direct road to narrative. To neglect this is to flatten things: to lose what photographers call depth of field. Why is mathematics difficult? Why is there no end to the story? I think I’ll have no difficulty persuading anyone that math is difficult. The “why” question though, is a bit more peculiar: think about it for a bit and you’ll see that it slips into that cellar of unanswerable queries. Compare it to: “why is Mt. Everest difficult to climb?” a question for which I think you can give a clear response, measuring the visible tangible physical form of the mountain to our physical tangible capabilities. The comparison came to my mind, having just read a fine article by Jordan Ellenberg, in which mathematicians are compared to mountain climbers, and the narrative accounts of mathematical pursuits is compared to the genre of mountain climbing narratives. That one grapples with and achieves a tenuous foothold in a towering mathematical problem makes the mathematician a metaphorical mountain-climber. That the mathematician wanders in new terrain, in search of new answers to new questions, makes him or her a metaphorical voyager (metaphorical at times, and sometimes actual; as in my brother’s book Euclid in the Rainforest). That the mathematician pursues and attacks: a problem turns us into hunters. 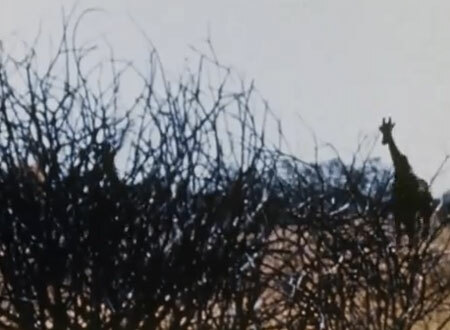 I saw, many years ago, that wonderful ethnographic film The Hunters about a five day giraffe hunt in the Kalahari Desert by four members of the Ju’Hoansi tribe (the footage was shot by John Marshall and produced in collaboration with Robert Gardner). I thought, on seeing the film, that mathematics was like that: you pursue your quarry for absolutely as long as it takes, exhausting yourself in the ecstasy of it, if necessary. When that giraffe is captured, you make use of every last bit of your prey, from the ears to the hooves. Mathematicians are giraffe hunters, I thought then, and now. …no art of hunting extends beyond hunting and capturing; and when the prey is taken, the huntsman or fisherman cannot use it, but they hand it over to the cook. And the geometricians and astronomers and calculators (who all belong to the hunting class, for they do not make their diagrams-and-proofs, but discover things that already exist)-they, I say, not being able to use but only to catch their prey, hand over their discoveries to the dialectician to make use of them, if they have any sense. The twist here is that Plato doesn’t give the last word to the mathematicians but rather recommends that they hand over their results to the philosophers, the cooks, as it were, so that the results be properly prepared. This sentiment is of course, debatable, and the debate is fodder for yet another… story. Barry Mazur has been doing mathematics and teaching it at Harvard University for over half a century. He has also taught courses on Kant’s Critiques, and on ancient mathematics. He is currently the Gerhard Gade University Professor at Harvard. His books include Imagining Numbers (particularly the square root of minus fifteen), published by Farrar, Straus, and Giroux, and Circles Disturbed: The Interplay of Mathematics and Narrative (jointly edited with Apostolos Doxiadis) recently published by Princeton University Press. You may not know what Abracadabra means, but you very well feel its magical force, and its effect only gains from the obscurity of the incantation. It is true, of course, that ipsa scientia potestas est (“knowledge itself has powers”), but being confronted with something that purports to be wisdom and is Greek to you, is even more powerful.